Patients with wide QRS-complex tachycardias (WCT). When none of the VT criteria is present, VT is still present in 15% of cases (Jastrzebski 2016). If there is doubt, the patient should be treated for VT. Using only the first two steps has been shown to yield an 81-96% positive predictive value for VT (Garner 2013). Although Brugada initially reported an accuracy of 98%, four subsequent studies have found accuracies ranging from 77-85%. May have limited agreement among physicians (in one study, up to 22% of emergency physicians disagreed on EKG interpretation using the criteria). Because current EKG algorithms misdiagnose WCTs 10% of the time (Grimm 1996), knowledge of diagnostic algorithms like the Brugada Criteria is important. The algorithm uses a stepwise approach to provide a sensitive, specific, and accurate way of differentiating SVT with aberrant conduction from VT. Using a stepwise approach prevents errors from being made in the differential diagnosis of tachycardias with a wide QRS complex. Compared to other criteria, this criteria is less prone to mistakes causing potentially fatal outcomes. The one exception to the rule is an Antidromic Atrioventricular Reentrant Tachycardia (AVRT), seen in Wolff-Parkinson White (WPW) Syndrome. Once the rhythm is identified, treat according to Advanced Cardiac Life Support (ACLS) algorithms. Use ACLS-recommended chemical cardioversion for stable patients. For unstable patients (altered mental status, ongoing chest pain, or hypotension), perform electrical cardioversion. This technique was first described by Pedro and Josep Brugada in 1991. They proposed the 4 step process for differentiating VT from SVT seen on EKGs with a wide QRS complex tachycardia. They validated their new approach by applying it to 554 wide QRS tachycardias and showed a sensitivity of 98.7% and specificity of 96.5%. A 1996 study by Herbert et al, published in Annals of Emergency Medicine, demonstrated that emergency physicians disagreed 22% of the time when applying the Brugada Criteria. In 2000, Isenhour et al published a study in Academic Emergency Medicine to validate the Brugada algorithm. Sensitivity/specificity were 85%/60% and 91%/55% for two cardiologists, respectively, and 83%/43% and 79%/70% for two emergency physicians. The four were not able to reproduce the high sensitivity and specificity seen in the original study. In 2008, Vereckei et al proposed a new diagnostic algorithm, restricting analysis to lead aVR and reported a superior accuracy to the Brugada Criteria (p = 0.002 vs p = 0.07). Baxi et al attempted to validate this new criteria and reported that four emergency medicine residents had a diagnostic accuracy of 74%, 75%, 61% and 68%. In 2013, Garner and Miller published an article in Arrhythmia and Electrophysiology Review compared diagnostic algorithms for WCTs and noted that the Brugada algorithm was one of the most accurate. In 2014, Vereckei wrote an article in Current Cardiology Review comparing several algorithms used for the diagnosis of WCTs and the Brugada algorithm was compared to the First Vereckei Algorithm, the aVR Vereckei Algorithm, and the Lead II R-wave Peak Time (RWPT) Criterion. Isenhour JL, Craig S, Gibbs M, Littmann L, Rose G, Risch R. Wide-complex tachycardia: continued evaluation of diagnostic criteria. Acad Emerg Med. 2000;7(7):769-73. Herbert ME, Votey SR, Morgan MT, Cameron P, Dziukas L. Failure to agree on the electrocardiographic diagnosis of ventricular tachycardia. Ann Emerg Med. 1996;27(1):35-8. Vereckei A, Duray G, Szénási G, Altemose GT, Miller JM. New algorithm using only lead aVR for differential diagnosis of wide QRS complex tachycardia. Heart Rhythm. 2008;5(1):89-98. Baxi RP, Hart KW, Vereckei A, et al. 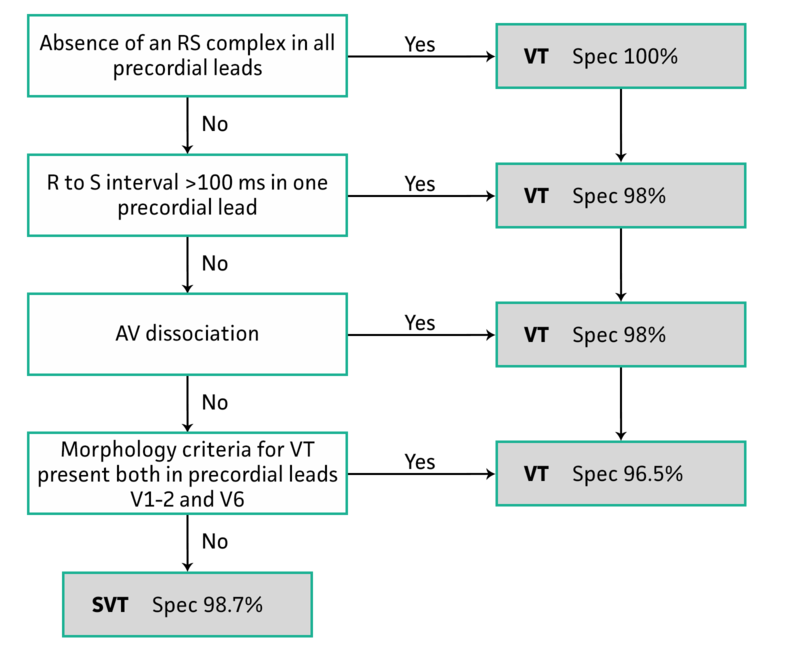 Vereckei criteria used as a diagnostic tool by emergency medicine residents to distinguish between ventricular tachycardia and supra-ventricular tachycardia with aberrancy. J Cardiol. 2012;59(3):307-12. Garner JB, Miller JM. Wide Complex Tachycardia - Ventricular Tachycardia or Not Ventricular Tachycardia, That Remains the Question. Arrhythm Electrophysiol Rev. 2013;2(1):23-9. Grimm W, Menz V, Hoffmann J, Maisch B. [Value of old and new electrocardiography criteria for differential diagnosis between ventricular tachycardia and supraventricular tachycardia with bundle branch block]. Z Kardiol. 1996;85(12):932-42. Jastrzebski M, Sasaki K, Kukla P, Fijorek K, Stec S, Czarnecka D. The ventricular tachycardia score: a novel approach to electrocardiographic diagnosis of ventricular tachycardia. Europace. 2016;18(4):578-84. Pedro Brugada, MD, PhD, is head of the cardiac arrhythmia unit at Hospital Estepona and the Heart Rhythm Management Centre at Brussels University Hospital in Brussels, Belgium. He has received the Gold Medal of the European Society of Cardiology for his work in cardiac arrhythmias. Dr. Brugada's primary research interests involve rhythmology and electrophysiology, and he has published over a thousand peer-reviewed articles and abstracts.